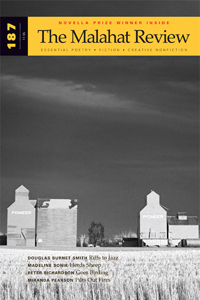 Malahat editor John Barton talks to mathematician and photographer Robert Moody about his photograph of grain elevators that appears on the cover of the magazine’s Summer 2014 issue. 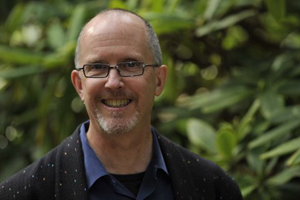 Robert is internationally recognized for his co-discovery of what are known as the Kac-Moody algebras. As a photographer, he recently collaborated with Jan Zwicky to publish Vittoria Colonna: Selections from the Rime Spirituali with photographs of Josep Maria Subirachs’ Passion Façade this year with Porcupine’s Quill. Anyone interested in seeing a larger body of his work can go to his photography site at Zenfolio. “Grain elevators in stormy skies,” which dates from 1995, is a remarkable image. Can you tell me something about the photograph’s origins, your intentions behind it, and your best guess as to why it continues to be so haunting? I have always been very attracted by the southern Alberta landscape, where the prairies and the mountains lie side by side and the sheer vastness of the landscape dominates the mind. I used to go down from Edmonton just to do photography. On this occasion I was driving south on Highway 2 late in the afternoon when this scene presented itself. The wind was ferocious and I remember well struggling with the camera and tripod to make the picture. As with many photographs, the light is a key ingredient. The sight of grain elevators and railway cars beside them is (or at least was) the standard feature of any prairie town. But the black sky of the clearing storm moving off to the east and the sun bursting through from the west gave the drama to the scene. 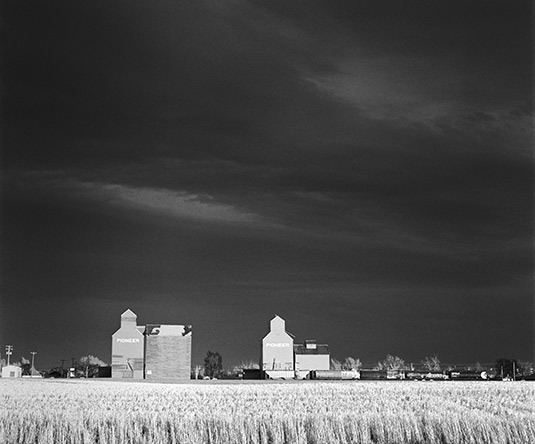 Robert Moody, Grain elevators in stormy skies, Southern Alberta, 1995. Digital image derived from an original silver halide negative. Collection of the artist. Grain elevators have almost disappeared from the prairie horizon. In her poem “Depth,” from the summer 2014 issue, Jan Zwicky observes: “But she was right, my mom, to try to save / the elevator. Loyalty / isn’t clinging, it’s a way / to know. Long love, its fragile afterlife: / details that we can’t forget.” While this photograph by itself could never save these grain elevators from demolition—are these three still standing?—it does preserve them in some way. Is adding to our collective memory an implicit goal of your work? I don’t mean in a simplistic, documentary sense, but as a way of “embodying” a time or place as it was or is for later contemplation, to allow for (to borrow from Jan) its “fragile afterlife”? Jan’s poem is beautifully evocative and I find myself responding naturally to it. We all knew that the grain elevators were vanishing, and I should have been out there responding to their presence before they were gone. But I didn’t, and I regret it now. I have to admit that while most of my photographs probably have some intention of embodying a sense of the time and place, they are taken more with the intention of re-invoking something in the viewer’s mind than with any explicit intention of preserving these things for the future. Borrowing a lovely word from your prefatory remarks, none of the photographs “interleaved” through Vittoria Colonna: Selections from the Rime Spirituali with photographs of Josep Maria Subirachs’ Passion Façade (Porcupine’s Quill, 2014) face any of Jan Zwicky’s translations of the late-13th century, early 14th-century Italian poet’s work. You point out that your photographs “are not intended to speak directly to [Colonna’s] thought, but rather to form a backdrop or a canvas.” Most of the book’s readers might have anticipated your photographs being used to “illustrate” Jan’s translations. Instead, the poems and the photographs are meditations in counterpoint with one another, like parts in a Gregorian chant. Can you elaborate on the relationship you perceive photography to have with other disciplines? I am struck especially by your saying that your work is not meant to speak directly to Jan’s translations. Photographs alongside poetry has always appealed to me. But really I have more ideas about the ways it doesn’t work than about the ways it does. It’s virtually impossible that a photograph can serve as a visual equivalent of a piece of poetry, or vice-versa. However, I do believe that each may offer a context for a deeper appreciation of the other. The fact that there is no information without context is perhaps the rather prosaic reason that we get more out of a collection of poetry by a poet or a gallery of photographs by a single photographer than we can from just one sample. So with visual and poetic images, each can add depth to the other. the tears cut gutters in his face. There is no visual counterpart to these words in the book, but the surrounding images of Subirachs' sculptures are equal testament to the compassion of this moment. Your way of saying this is very nice: ‘the poems and the photographs are meditations in counterpoint with one another, like parts in a Gregorian chant’. Is Vittoria Colonna your first collaboration with Jan? As a photographer, what is it like to work with a poet? Do you foresee any future collaborations with Jan or other writers? I love Jan’s poetry and her extraordinary mind which shines through all of it. She has used my photographs for the covers of several of her books, and has occasionally sent along a set of poems with the query as to whether I could fit photographs to them in some way. Of course this is very flattering, but it is also very challenging, to say the least. So it was with the Vittoria Colonna poems. The poems, and Jan’s English versions of them are wonderful, but how could one find photographic images that correspond to the depth of sentiment expressed there? I had no idea until I came across some photographs of the Basilica of the Sagrada Familia in Barcelona and the evocative sculptures of Josep-Maria Subirachs that make up its external Passion Façade. I went there and took a lot of photographs with the Vittoria poems specifically in mind. Jan responded immediately to the photographs, but we also understood that the poems and the photographs were not in any way one-to-one equivalents. By interleaving the two, and not placing them directly against each other, the reader/viewer is not moved to find direct correspondences, but rather to weave them into a larger whole. That at least is the intention. It was wonderfully easy to work with Jan—the book seemed to come together almost on it own. Yes, we would like to do something else together. How it will happen I have no idea. We don’t have a formula for it. You are a mathematician as well as a photographer. Which came first and how do numbers inform your work with a camera? No doubt I am a mathematician first. That is where my mind turns automatically—the habit of a lifetime! But the connection between the mathematics and the photography? That’s an interesting question, and one that I have asked myself a lot of times. Jan says it’s obvious, but it took me a lot longer to understand. First of all, if you replace “numbers” by “pattern” in your question you have a better idea of how mathematicians view mathematics. For instance, my own mathematical interests for the past twenty years have ranged around long-range order; how local order relates to a larger extended structure. This is a central problem in modern crystallography and the material sciences, as well as in mathematics. We could call this form. Then there is abstraction—you will have noticed that almost all my photography is in black and white. That in itself introduces a significant level of simplicity and abstraction. So we have simplicity, abstraction and form, three rather obvious aesthetic aspects of mathematics. The final aspects of my photography, light and tonal texture, have perhaps no direct mathematical equivalences, but are deeply appealing to me. The last is something that is best appreciated at the level of a good photographic print held in the hand. The actual working and physically printing of photographic images is one of the most enjoyable aspects of photography for me. Particularly in black and white, what comes out of the camera is very rarely the final image. Ansel Adams famously described the negative (or digital file these days) as a musical score, awaiting a performance to come alive. (In fact he even left his negatives for posterity so that others might have the pleasure of printing, and thereby interpreting, them.) I don’t mean by this that photographs need to be radically transformed in Photoshop, but from the very beginnings of black and white photography photographers have routinely interpreted the bare output of their cameras through the printing process. And then the physical aspect of a well-printed photograph is very important to me, just as holding a beautifully produced book is a joy in itself. I should perhaps say that when I am photographing and printing, apart from trying to be meticulous the mechanics of printing, I don’t pay any attention to anything except how I feel about what I am seeing. So whatever those mathematical connections may be, they are far from intentional. I am very struck by your use of the word “pattern.” It echoes my sense that poetry is less about the individual words themselves than about how we arrange them—or orchestrate them, if you like, to echo Ansel Adams’ sense of creating. And of course some poetries, can get very “mathematical” in their adherence to a syllable count, and I’d argue that one could find a algebraic or geometric equivalent to rhyme in math. I am wondering if part of the appeal of poetry—and Jan’s poetry being the example at hand—rests in its careful, equation-like expression of experience, and if so, can you elaborate? I think you are on to something here. Pattern is such an elusive concept, but there are two aspects which I think are characteristic of it. The first is that it more about relationships between things than things themselves. That fits well with your suggestions about the importance of arrangement and “orchestration” of words in poetry, and it is absolutely essential to the ways in which symbols and ideas make up mathematics. The second extends this: pattern involves the way in which parts correlate to each other. The resonance between parts that so relate them as to create in the mind a coherent whole is, I think, important to Jan’s thinking and is a key point in her poetry. It is also a feature of aesthetically beautiful mathematical theories. Coming back to photography we see the same thing. In a good photograph we feel that every part of the photograph is essential to its success. Anything more or anything less would detract from it. This is slightly different than talking about equation-like expressions as such, but perhaps only in degree. An equation surely expresses coherence between the concepts associated with the symbols within it, but not every form of coherence needs to be so precisely or so explicitly stated.